We are well into February, Christmas and New Years are a distant memory and 2016 is starting to feel comfortable like a new pair of shoes that you’ve managed to break in. You have been to the gym twice after signing up hastily in the wee hours of the New Year. You’ve only just cleaned out your fridge, removing all the mouldy and shrivelling vegetables bought after your “New Year, New Me” inspired health kick was kicked to the curb when you heard KFC now do 24 nuggets for $10. You’re avoiding several voicemails from parents out of guilt because this was the year you’d make more time for family. There’s a half-constructed D.I.Y project sitting in your shed as heading to the pub is slightly more interesting than your newly discovered hobby. If you identified with one or more of these, then congratulations – you’re officially as unreliable as the rest of us. But just because your New Year’s Resolutions have failed, doesn’t mean your lawn and garden have to. If fixing up your backyard was one of 2016’s resolves, but you’re unsure of where to start – turfmate has got you covered. 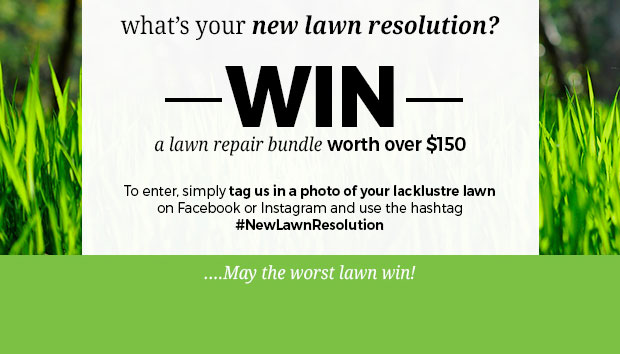 To celebrate the launch of our New Home Newsletter, we are giving away a New Lawn Resolution pack worth more than $150 for one lucky person to bring their lawn back to life! You could win a bundle including an Oscillating Sprinkler, Lawn Soaker, Sir Walter Fertiliser, Colour Guard Grass Paint and Macspred Glymac 360 – all the perfect components to let your lawn be the envy of your neighbours. There is a bundle to be won each week, so get tagging! Best of luck and may the best worst lawn win! Don’t have us on Social Media yet?